Physically active is a great way to describe Kallyn Lefebvre, an aspiring NHL star and ‘2028 draft pick’ (according to his Dad, Jimmy.) 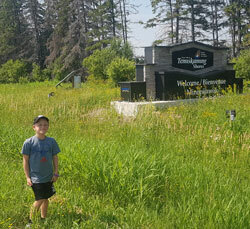 Kallyn is now walking up to 13 kilometres a day with his family, including his Dad Jimmy, Mom Kristie, Grandma Rita and siblings Dylan and Kayden. Just 8 years old, Kallyn is very motivated for his age, loves hockey with a passion and is excitedly counting down the days until he can start up hockey practice again. 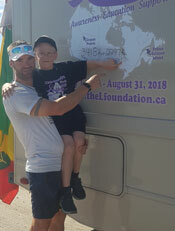 He’ll be sure to be in his best form when the time comes, as the Lefebvre family will soon finish their walk across Canada aimed at putting an end to cancer. Kallyn and Dad showing us where they are. “I’m getting stronger,” Kallyn shares proudly, reflecting on how far they’ve come. 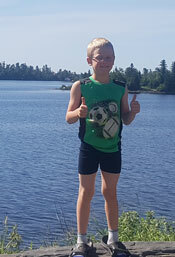 A typical day for Kallyn involves walking with the family on and off, then at the end of the day stopping at a campground where he can’t wait to go swimming and play sports. “The best thing about the walk is free time at the campsite, playing soccer, baseball, football and with hockey sticks,” says Kallyn. He also makes sure to leave time for a daily exercise regimen, including burpees, which are his favourite. 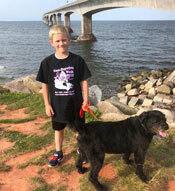 Just having entered Prince Edward Island on the final stretch of the family’s journey, Kallyn says the most interesting thing about the walk has been all the places he’s seen, and the people he’s been able to meet along the way. Kallyn has a remarkable can-do attitude, though the walk has been challenging to him, now and then. “The hills have been the hardest,” Kallyn says.